After meeting the titular head of British Imperialism Inc and giving her his best smile, McGuinness told reporters “It went really well” and claimed “I’m still a republican”. He’s still a republican in the same way that Gerry Adams was “never a member of the IRA”, no doubt. The decision of the Sinn Fein leadership to meet the English queen during her Belfast jubilee visit defies all republican logic. 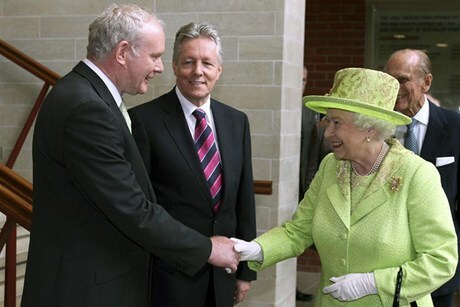 Firstly, any presumption that a handshake with an unelected monarch is necessary to show goodwill towards the Protestants of the north goes against even the most basic original republican teachings, in which Tone, McCracken and other Protestant leaders identified fiercely with the principles of equality, liberty and fraternity. Elizabeth Windsor is a privileged and pampered English aristocrat, apparently granted Sovereign power by God himself; to suggest that Irish Protestants can only find a sense of identity through loyalty to such a figure is an insult to both them and the generations of activists who have fought to reverse this stereotyped notion of the ‘Ulster Protestant’. Some republicans and some nationalists are very upset that Martin McGuinness will be shaking the hand of Betty Battenberg (or Windsor, or whatever her real name is) this week. Personally, however, I don’t see any reason to complain. 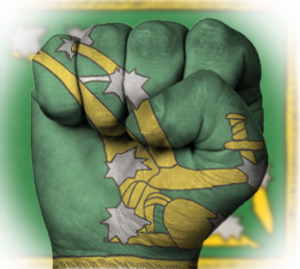 The Provo leadership are handmaidens of British-political and capitalist-economic rule in the north. Why not shake the British queen’s hand? It’s the perfectly logical thing for these people to do. Indeed, he may as well kiss the queen’s arse while he’s at it, so we can all see the real power relationship between the Brits and the Shinners. The handshake also points up the partitionist nature of the Shinners these days. éirígí’s Rúnaí Ginearálta Breandán Mac Cionnaith has responded to the decision by the Sinn Féin leadership to endorse a meeting with the British queen, Elizabeth Windsor, commander-in-chief of Britain’s armed forces. Mac Cionnaith said, “The decision by Sinn Féin to meet with the British queen is not in the least surprising, unanticipated or unexpected. However, that decision needs to be examined in a broader context. “The Sinn Féin leadership previously took the strategic decision to gradually and consciously move that party away from its former role as a vanguard of the anti-imperialist struggle in Ireland. That leadership has also proven itself, in recent times, to be a willing ally of modern neo-con imperialists by assisting the undermining and subversion of anti-imperialist liberation struggles in other countries. Ireland Institute, 27 Pearse Street, Dublin 2 / Institiúid na hÉireann, 27 Sráid an Phiarsaigh, BÁC 2. 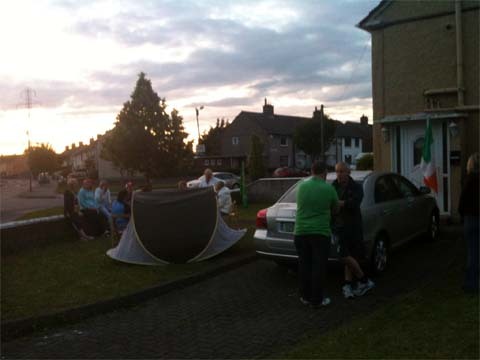 For three days in early June, the people of Bluebell, a close-knit working class district on the banks of the Grand Canal in south Dublin, demonstrated what the word ‘community’ really means. On Tuesday, June 5, the Byrne family asked their community for help, to prevent their eviction from their home of twenty years the following day (June 6). Despite the very short notice, the residents of Bluebell and surrounding areas turned out in force to answer the call for help. 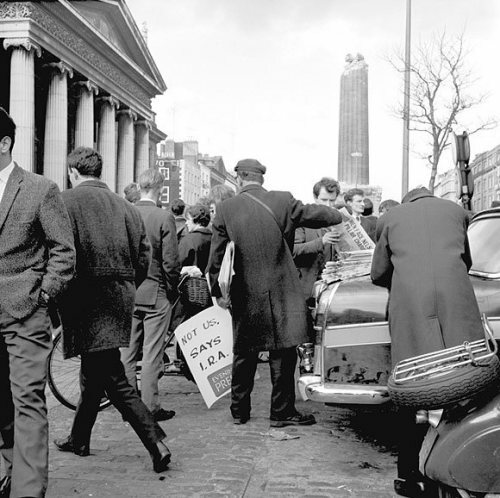 Here in Ireland there are many 1916 commemorations that are held annually by various groups and parties, but unfortunately, only a very divided fraction of those celebrate it from a revolutionary point of view. As we enter an even deeper economic crisis of uncertainty and destitution, the choke hold of capitalism continues to tighten its grasp among its hapless victims. What we are witnessing now, is how our history, both past and present, are inextricably linked together through struggle. And how that time and time again, capitalism continues to dominate over our very lives, everyday. Following a series of meetings both inside and outside Palestine, the central committee of the Popular Front for the Liberation of Palestine released a statement on May 16 on regional and international developments; it can be read over on the Redline site, here.